In this episode I share an interview with Cheryl Jones, host of the Good Grief Radio Show, therapist and author of the newly-released novel An Ocean Between Them. 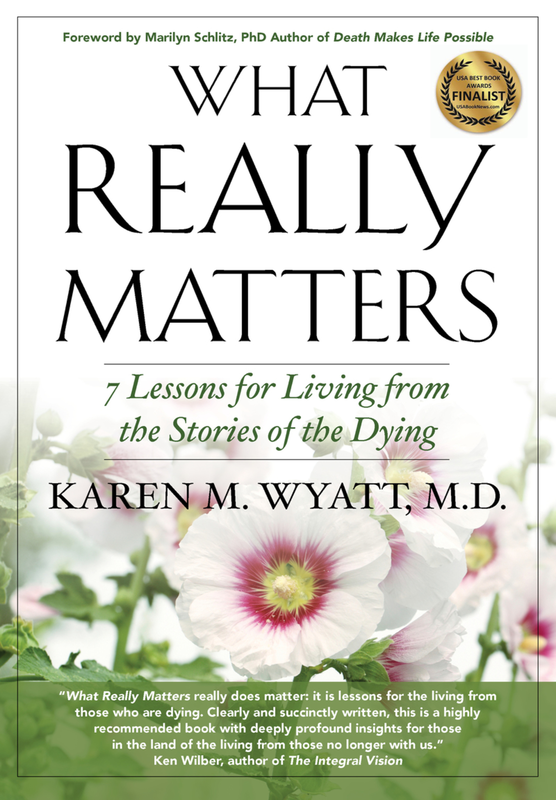 We talk about the important subject of meeting the needs of members of the LGBTQ community at the end of life, which is part of the story told in her new book. Learn about Cheryl’s work here. I’ll be leaving for Spain in just a few days! While I’m traveling you will be able to listen to a 4-part series on Palliative Care during this podcast so you won’t miss a single episode! If you’re interested you can follow my photos on Instagram at kwyattmd! A HUGE THANK YOU to my latest supporters on Patreon.com/eolu: Lisa Milton, Debbie Hall and Christine Hazard Phillips. Your contributions are greatly appreciated and help keep this podcast and the EOLU Interview Series on the air. Join the team to get special bonus content! CSU Institute for Palliative Care is holding a National Symposium on Palliative Care in San Diego October 11-12. Go to CSUpalliativecare.org to learn more. My guest Cheryl Jones is a grief counselor, host of the Good Grief Radio Show on VoiceAmerica, and the author of the newly-released novel An Ocean Between Them. We will discuss the challenges that LGBTQ people experience in receiving care at the end of life and ways to make our organizations and facilities more inclusive. Cheryl Jones is the host of the radio show Good Grief. She is also a grief counselor and cancer educator. During her education as a Marriage and Family Therapist, her first wife was diagnosed with Multiple Myeloma, which was at the time a uniformly terminal illness with a six month to one year prognosis. In the eight + years that followed, Cheryl engaged daily in the work of preparing for her death. She received training during this period from Stephen and Ondrea Levine (Who Dies and Grieving Into Life and Death) and Richard Olney (founder of Self-Acceptance Training). After her wife’s death, Cheryl immersed herself in her own multifaceted grief, surprised by frequent moments of joy. Cheryl is a consultant and group leader at the Free Therapy Program of the Women’s Cancer Resource Center, where she developed, manages and teachies in their Continuing Education program. She has trained extensively with Erving Polster, leader in the field of gestalt therapy and author of Everybody’s Life is worth a Novel. She was Clinical Director at the Alternative Family Project, which served the therapeutic needs of LGBTQ families in San Francisco. Finally she is the author of the recently published novel: An Ocean Between Them. Tune in every Monday for a new episode (even when I’m traveling!) If you enjoy this content please share it with a friend and consider leaving a review on iTunes. Learn some tips for starting important conversations about death with people you are meeting for the first time! You can still sign up for A Year of Reading Dangerously online reading group and read one book each month about death, dying and the afterlife. Click here to learn more. You can listen to samples and purchase the album here. Stay tuned to the end of the podcast as I’ll play her song Evocation as the Outro today! A HUGE THANK YOU to my latest supporter on Patreon.com/eolu: Karen Van Hoof! I appreciate your support very much. Thanks also to all of the other patrons – sign up and join the team for as little as $1 per month at Patreon.com/eolu! Today I’ll tell you about my recent 5-day retreat at a yoga center where I went to relax, do yoga and finish revising one of my books. While I was there I had the pleasure of talking with many other visitors to the retreat center about death and dying, which was fascinating. Normally I don’t find many people out in the general public who want to talk about death. And while the people I conversed with weren’t necessarily interested in death before our discussion they each seemed to come away with a new understanding or sense of peace. In order to confront our society’s fear of death we need many more conversations like this to happen every day with people who are not already tuned in to death awareness. Each of us needs to step up and reach out to others to start a dialogue about death that might prove very helpful to our conversation partner and very informative for us. Choose the right time and place: my conversations generally took place at the table while I was sharing a meal with various strangers. Breaking bread together creates an automatic sense of connection and safety since we usually associate mealtimes with positive feelings. There is also often some free time between courses where conversation can happen naturally. It may also work well to talk about death during other shared activities like hiking, gardening or cooking. Watch for the right opportunity to arise. Find common ground first: make sure you have established a basic connection by talking about the meal (or the garden, or the hike, etc.) Since my conversation partners were also there for yoga classes we had an automatic common subject to begin chatting about while we established a connection. Perfect your “elevator speech” which is a very brief story you tell whenever someone asks “What do you do?” The idea is that your answer is so brief you can complete it during a short elevator ride from one floor to the next. So think of one or two sentences you can use to answer that question and give another person an idea of your work. My answer at the yoga retreat was: “I’m a retired hospice physician who now writes books.” Tell them enough to garner their interest and curiosity and lead naturally to more questions. I purposely avoided mentioning death and dying in my initial introduction so that I wouldn’t frighten anyone away before we even got started. But most individuals I encountered were intrigued and asked more either about the hospice work or about the books I’m writing. Both of those questions led directly to a talk about death and dying. On several occasions the other person immediately brought up a story of a loved one or friend on hospice. Many times it was a story that desperately needed to be told and also came with questions about death, dying and hospice. I was amazed by the quality of conversation that occurred in these instances and the need for accurate information. I’m convinced that many people out there really do need to talk about death and dying but rarely encounter anyone they can speak to, which is where you come in! Hone your listening skills: for these conversations focus on listening rather than telling your own story. Watch for cues from the other person that there is a need to say something and encourage them to talk by asking a question or two and stopping to listen attentively. We are all passionate about our work and other endeavors and there will be opportunities to share that at some point in the future. Initially it’s more important to just listen and hold space so that the other person can ask questions and get the support they need. Rely on your intuition to tell you when that person is ready for a little nudge or encouragement to go deeper into their feelings. Share just enough information: again it is important to be a good listener so when you do describe your work don’t go overboard. Use simple and accurate terms to convey what you do but pause and allow the other person to ask for the information they need. As you’ll hear when you listen to this episode I was able to have meaningful conversations with different people every day while I was at the retreat. These are some of the most important discussions we can be having right now so take a chance and strike up a conversation with a stranger about death and dying! There will be a new episode every Monday so be sure to tune in again! And if you enjoy this content please share it with others and consider leaving a review on iTunes.